This month’s Food ‘n Flix movie was Lady and the Tramp , a movie I hadn’t seen since I was quite young. In Food 'n Flix, participants watch a movie and then cook something inspired by the film. This month, Elizabeth from The Lawyer's Cookbook is hosting. I borrowed a copy from the library and my boys and I got to watching. The boys actually loved the movie, especially the well known spaghetti scene, where the dogs “kiss”. Spaghetti & meatballs would have been the obvious food choice for this film. I definitely considered it, but in the end changed my mind. There’s quite a bit of food inspiration in the movie, but it goes fast (I had to watch twice to catch it all!) and lots of the food comes from different cultures (the Tramp is seemingly “adopted” by several immigrant families/restaurant owners). My inspiration for this movie came from a combination of 3 events in the movie. First, when viewers initially meet the Tramp, he is deciding where he’d like to beg for scraps. One of his options is Francois Pastries, with a window full of cakes and other goodies. Next was a baby shower for Jim Dear and Darling (and Darling is knitting pink baby booties). And last after their son is born (incidentally, did you know that pink used be considered a boy’s color and blue for girls? ), Lady first meets the baby while Darling sings La La Lu. I could not get La La Lu and the baby out of my head! It made me think if little Sarah Catherine, who never got a baby shower (though probably wouldn’t have anyway, since she was my third), or lullabies. My angel. My star sweeper. Sorry, am I making a happy part of the movie depressing? I hope not. It actually brings me a lot of peace. 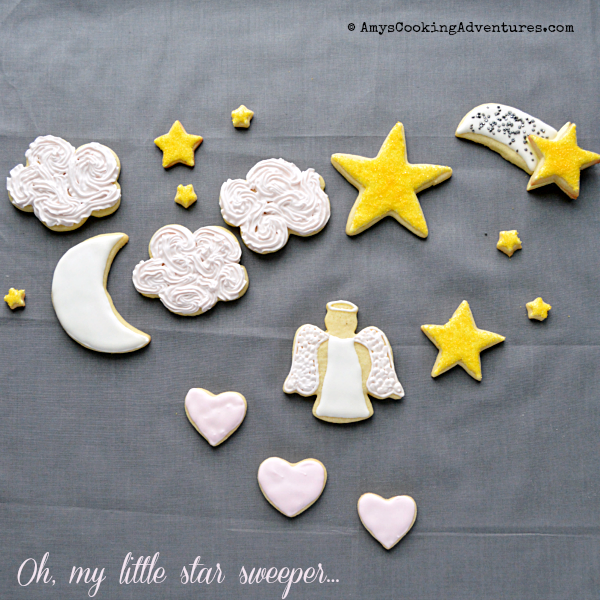 I imagine Sarah Catherine as my little star sweeper. With pink sunrise clouds, folding her angel wings. So, I made baby shower cookies for Jim Dear & Darling’s son and for my daughter. It’s a bit difficult to tell in the photos, but those clouds are tinted the softest pink. 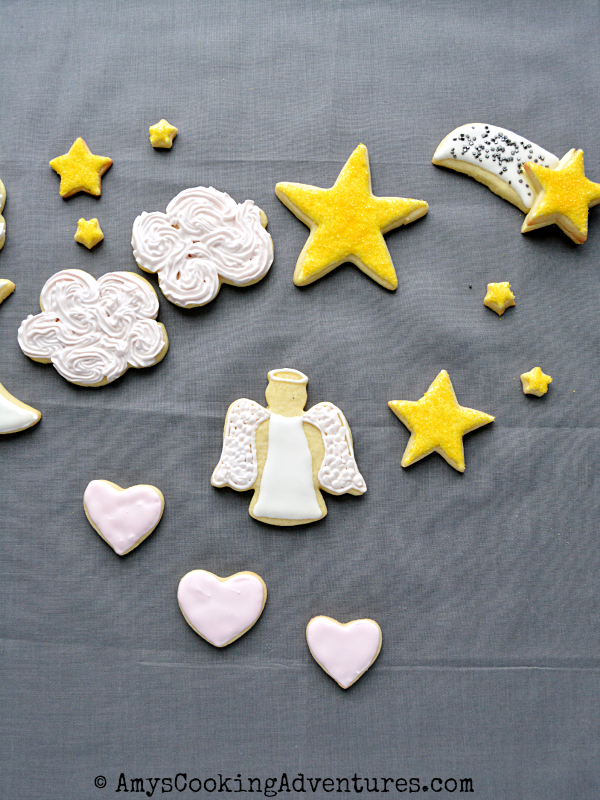 I used my favorite sugar cookie recipe for these cookies, along with this recipe for royal icing. Sleep sweet little star sweeper. Sleep sweet. 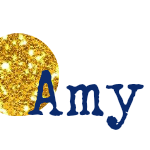 Oh my gosh Amy.....what a perfect choice for you. Thank you so much for sharing it with all of us. I came over from Lovely Link Party to see your pretty cookies and I'm so glad that I did. 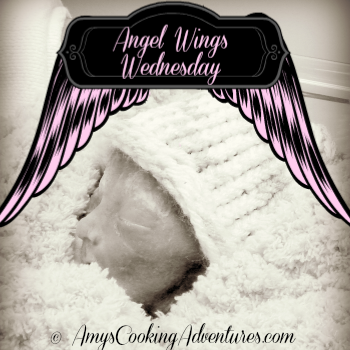 I love how you shared about your sweet angel, Sarah Catherine. What a beautiful tribute to a lovely heavenly daughter. This is beautiful. Not only do I love your inspiration from the movie for this month's flick, but I love that you made it something very special for you. I love this post. I love the inspiration you took from this month's flick, but I'm also very happy you chose something that's special to you. I'm glad you were able to find some comfort in making the cookies and posting about them. It is a beautiful post and thank you for sharing about your daughter. Thanks for sharing. I think your post and recipe is perfect. Such a beautiful post Amy--I love your cookies--which are perfectly gorgeous and I am glad that they brought you comfort too. Thank you for sharing your inspiration and touching story. Very sorry your experience but a beautiful way to immortalizer here from these cookies, great inspiration.